In our last chapter we introduced a bit of rennet to help create our cheeses. Now we’ll move on to the largest family of cheeses—those that rely completely on rennet for coagulation. Most will still use bacteria, too, to produce acid, but the acid doesn’t cause the coagulation. Because these types of cheese coagulate before they get too sour, the final texture is much more pliable and sliceable, not crumbly and brittle. They also are less tart, able to age for long periods of time, and generally have more potential for complex flavor and aroma development. At the end of the last chapter I told you that you are now going to need to apply some principles to your process—namely that every cheese relies upon a combination of time (during ripening, stirring, and draining); temperature (during ripening, stirring, and draining); and final acid content to create the final product. Fresh, soft cheeses are quite forgiving if you deviate a bit from the recipe steps, but cheeses that rely on rennet alone are a bit pickier. This chapter will give you practice paying attention to the nuances of these steps. It contains three recipes for three very different cheeses—quick mozzarella (the only one in this chapter that does not use any starter culture), feta, and a farmhouse-type cheese—you can master quickly and begin to feel more confident about your cheesemaking skills. The cheeses in this chapter are a great transition from soft fresh varieties to the more complex cheeses that rely completely on rennet for their coagulation. Many of these are still used fresh, but are obviously great for different types of uses than their spreadable cousins. Some of the recipes in this chapter can even be transitioned into aged versions. If you are chomping at the bit to make some aged cheese, don’t worry, we’ll get to that very soon! 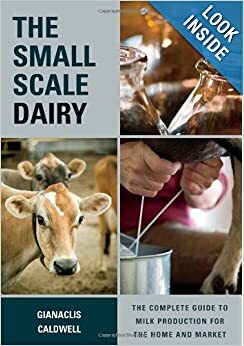 The cheeses in this chapter will usually yield about 0.85–1.1 pounds per gallon of milk (0.4–0.5 kg per 4L), depending on how what type of milk is used and how they are drained. As with the other methods, the first step is getting the milk to the right temperature. This temperature will vary a bit depending upon the type of cheese being made, but it is typically right around 90°F (32°C). As in the previous method, a double-boiler type setup, with the pot of milk set onto a larger pot or into a sink filled with hot water, works best. As in the previous method, bacteria cultures are added to the milk once it has been warmed to the ideal temperature at which they grow. Sprinkle the culture on the top of the warm milk and allow it to sit for a few minutes while it soaks up a bit of milk. During the ripening or incubation phase, the cultured milk must be held at the ideal temperature for a short period of time, usually 20–60 minutes. It is fairly easy to ripen the milk using the same double-boiler approach you used to warm it. Typically, covering the pot with a lid is enough to keep the milk warm for that period of time. It is a good idea to stir the milk at least once and double-check that the temperature hasn’t dropped. If it has, the milk can be gently rewarmed. As in the previous method, if calcium chloride is to be used, it is diluted and added about five minutes before the rennet and allowed to sit. As in the previous method, after carefully measuring the rennet, dilute or dissolve it in cool, non-chlorinated water. Before adding it to the milk, stir the milk using an up-and-down motion with a ladle or spoon. Stop stirring briefly and pour the diluted rennet over the top of the ladle, and then continue stirring for about a minute. Then hold the ladle to the top of the milk in several spots to help still the milk. Q: If the milk isn’t coagulating, should I add more rennet? A: Milk may not coagulate well for several reasons: The rennet may be too old, the water used to dilute the rennet may be too high in minerals, a bit of calcium chloride may be needed, or there may be sanitizer residue on your utensils. In any case, adding more rennet after the first addition is unlikely to work at all. Q: If the milk cools down during coagulation, should I reheat it? A: No, not until after the curd is cut. If you try to rewarm it, you will heat up the curd around the outside of the pot – the heat won’t transfer evenly to the center. The outside curds will likely get too warm. After the rennet has been added, the milk must sit very still and not be bumped or stirred. Even vibrations from a counter or floor can cause tiny breaks in the coagulation. The coagulation period will usually last 30-60 minutes, depending on the type of cheese. This is really a sub-step of coagulation, but it is one of those that sounds so mysterious and brings about so many questions that I want to give it a full explanation. The curd is ready for the next step when it has formed a mass that can be cut without any loss of milk fat. You can check for this by doing the clean-break test: Make a small cut (about 2 inches [5 cm)] in the mass with your curd knife, slip the knife, with the flat side up, about 4 inches (10 cm) under the slit in front of it at about a 30-degree angle. Gently and slowly, lift straight up. The pressure of the knife will cause the cut to travel forward in the curd. If the break is smooth and clean, and the whey that leaks out from the break is not whitish, then a clean break has been achieved. If the break is not clean, wait about 5 more minute then try again. Different milk types and cheese recipes will create a different thickness and heaviness in the coagulated mass, but you will still look for the same result in the clean break. 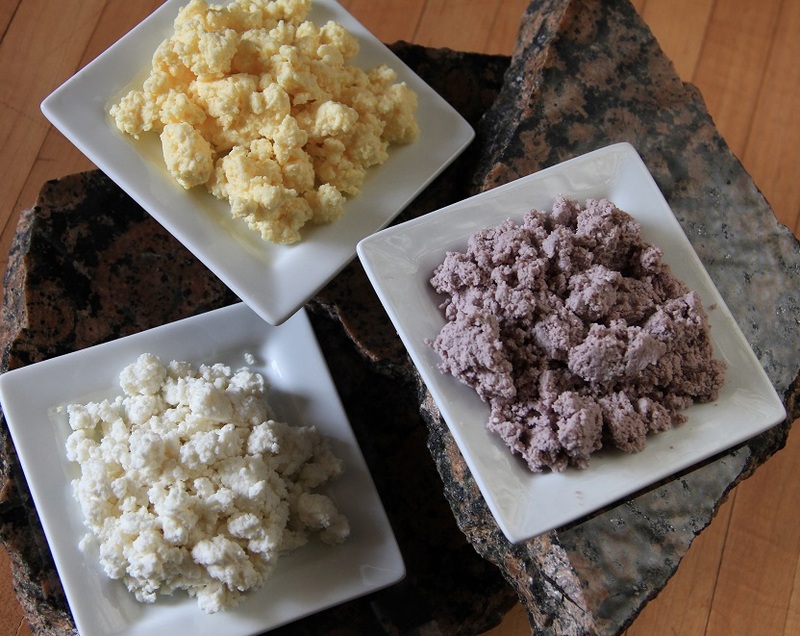 Once coagulation is complete, the mass is cut into smaller pieces called curds. (No, these are not the same thing as fresh, squeaky cheese curds.) Cutting exposes a lot of surface area, which allows the curds to quickly lose whey. Different types of cheeses have different goal curd sizes. Don’t worry if your curds are not perfect cubes—no one’s are—but do try to cut them as uniformly as possible. The first cuts create vertical columns (these are the easy ones). Next, the curds are cut horizontally; it is easier to make the horizontal cuts curds in a wide, shallow pot than in a tall skinny one so keep this in mind when choosing a vessel. After the cuts are made, most recipes call for “resting” or “healing” the curds for about five minutes. During this time, the curds will lose some whey from their surfaces. In doing so, they become a little less fragile so that they don’t break apart as easily when you start to stir in the next step. 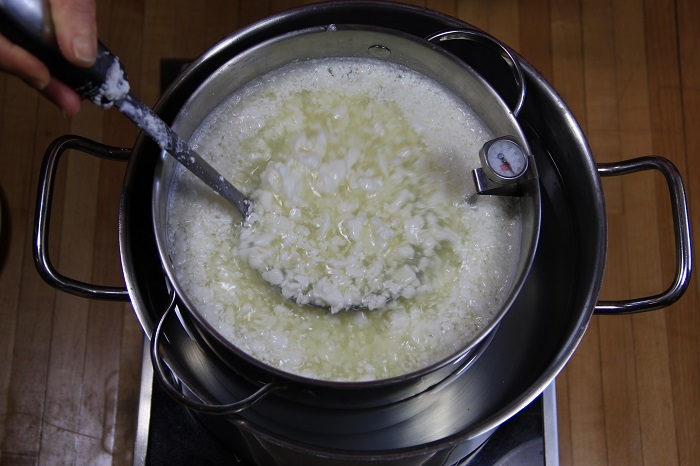 Most recipes produced by this method include a step in which the curds are heated (or “cooked”) and stirred. (The exception in this chapter is Feta) Just how hot and how much stirring is involved varies quite a bit. Whatever the instructions say, the stirring must be as gentle as possible to keep the curds from being shattered into pieces that are too small. In some cases this may even mean gently shaking the pot for a while instead of using a spoon or ladle. After the curds have been moved around a little, they will shrink and firm up a bit so that you can stir them more easily. If the recipe involves heating the curds, it is very important to do so as slowly as possible— especially in the beginning—and no faster than the recipe calls for. If you heat them too quickly, only the outside of the curd will dry and firm, leaving a mushy interior with whey trapped inside. Trapped whey leads to soft, sour spots in the cheese. The goal of the heating and stirring step is to get the curds to the right texture for draining and pressing. For some cheeses, the goal texture is a tiny, very dry curd; for others, it’s a larger, more tender curd. Stir or agitate the curds as gently as possible; if they start shattering, you are stirring too roughly. If any curds are too large, you can cut them into smaller pieces during the stirring step. Once the curds move easily and don’t break, stir only as gently as needed to keep them moving; if you stir too rapidly, they will become tough. Pay close attention to how rapidly the curds are heated; heating more slowly in the beginning is always better than too fast. 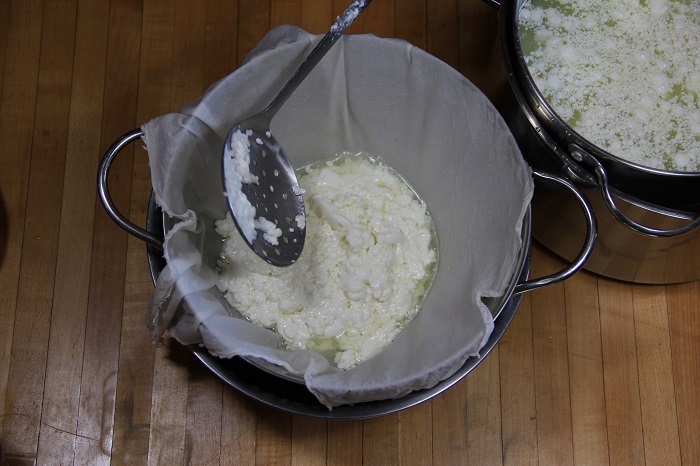 Once the texture of the curd is just right, the next steps involve removing the curd from the whey by draining the pot, and then removing the whey from the curd by pressing it. Some recipes call for pouring the curds and whey through a strainer or directly into the cheese forms, while others have you gather the curds into a ball while they are still submerged in the whey. Once the curds have been removed from the whey, they are placed in a form. Almost all cheeses need to be drained and/or pressed in a cheesecloth-lined form. (There are a couple of exceptions, such as cheeses with large, tender curds that won’t have any weight applied to them, like feta.) You must pick a combination of form and cloth that allow the curd to drain as quickly as possible, but without letting any curd escape. If the form has a very open pattern of holes and you apply too much weight, curd might mush out through the holes. On the other hand, if the form doesn’t have enough holes, the whey might not drain off of the cheese as quickly as you want, leaving whey trapped in the curd and an uneven pattern on the outside of the cheese. Choose a form and cloth that allow the curd to release a lot of whey, but don’t allow the curd to pass through when pressed. If the curd is getting stuck in the cheesecloth, the cloth is too open or you are using too much weight. Observe the cheese when it is flipped: The outside should be smooth and closed by the last flip. If it closes too early, you are using too much weight too soon. If it isn’t closed by the end, apply more weight. You only need a mechanical press for cheeses where the curd is salted before pressing, such as cheddar, or cheeses where the curd is very tiny and dry, such as Parmesan. Most cheeses can be pressed with other types of weights such as water jugs or barbells. Weight is added to help remove the whey and to reform the curds into a nice, smooth wheel. Cheeses that have an open texture, such as feta, are not pressed, while those with a very tight, closed texture have a lot of weight applied. During the pressing phase, the cheese is unwrapped, flipped over, rewrapped, and pressed about three more times. It is during these flips that you will decide if you are using enough pressure (see sidebar above). You should think of the pressing phase as another ripening step. During pressing, the cheese will not only form into a wheel, but the bacteria will continue to grow and make acid. For this reason, the temperature of the room during pressing is important. Some recipes call for the temperature to drop by the end of pressing, but usually room temperature, 68–72°F (20–22°C), is ideal. It is essential that the right amount of acid be produced, so that the cheese will be safe for aging and have a balanced flavor. If too much acid develops, the curd will be sour and brittle. The home cheesemaker may not have the ability to measure this acid production with a pH meter (and pH strips won’t work for checking solid cheese curd), but over time you can train your taste buds to detect the perfect sourness. Once you have finished draining and pressing the cheese, it is important to both cool and salt it. By cooling the cheese, you quickly slow and then stop the growth of the bacteria, which will help prevent the cheese from getting too sour and possibly become brittle during aging (the extra acid damages the invisible structure of the cheese curds causing them to break apart). As you learned in chapter 2, salt will help stop the bacteria from growing too, but if the cheese is thick, the salt won’t make it all of the way to the center of the wheel for several days. If you are dry salting, rub the first coat on all sides of the cheese, rewrap it in the cheesecloth, and replace it in the form. Set the cheese in a cool area, ideally about 50–55° F (10–12° C). By rewrapping the cheese you will help keep the salt close to the wheel and also prevent the cheese from changing shape before it cools and firms. The second coat of salt should be applied as the specific lesson indicates. All of the cheeses in this chapter can be used immediately after they are finished, you don’t really even need to chill them. Some will benefit from a few days of resting in the refrigerator, though, as the salt and flavors will have a chance to comingle and smooth out. Many will last weeks in the fridge as long as they are tightly wrapped and protected from contaminating yeasts and molds. A little surface mold can simply be cut away and the rest of the cheese used. The whey that is produced during the lessons in this chapter (with the exception of quick mozzarella [lesson 12])—and all similar recipes—contains many nutrients and some starter culture bacteria. The nutrients consist of a lot of whey protein and some milk sugar. Because the fresh whey from these cheeses isn’t very acidic (in fact, it is called sweet whey), it can be used for a variety of things, including making whey ricotta (see bonus recipe in chapter 8). In the kitchen, fresh sweet whey is great in soups, when making bread, and can even be used as a beverage (either plain or flavored). It can also be fed to chickens, pigs, and even calves. Because of the nutrients in the whey, it shouldn’t be poured down drains in large volumes, but the home cheesemaker doesn’t need to worry about that too much. Quick mozzarella is truly a miracle recipe, but one that may not work every time if the milk you use varies a lot. It is one of those recipes that initially seems foolproof to many beginning cheesemakers, but in fact is not. Traditional mozzarella takes all day to make, uses starter culture bacteria for flavor and acid, and can be aged. Quick mozzarella, on the other hand, has added acid, more rennet, and can often be made in under an hour. The longer method definitely produces a more complex cheese with better texture, but the tradeoff is about five hours of your day! I recommend using store-bought whole cow’s milk the first few times you make the quick version. Because this type of milk is mass-produced, it is less variable and, therefore, less likely to misbehave. After you get a good feel for the process, give it a try on whatever other milk you prefer. Mozzarella is in a category of cheese called pasta filata, which is Italian for stretched or kneaded dough. Most of the cheeses in this family, such as Kashkaval, caciocavallo, and provolone, are from Mediterranean countries. Latin American countries also produce traditional cheeses in this group, including Oaxaca, which is formed into a beautiful skein that you unroll as you use the cheese. Stretched-curd cheeses rely upon a precise balance of minerals in the curd, acid content, and temperature. If any of these things is not just right, the stretch will be less than ideal or nonexistent. But don’t be intimidated—I have yet to have the following recipe not work! Add acid: Pour to the cold milk into one of the pots. Add the diluted acid, and, using the ladle, stir together well. Heat Milk: Place the pot over medium heat or in a water bath on the stovetop. Heat the milk until it reaches 88°F–90°F (31-32°C). Turn off the heat. Rennet and Coagulate: Stir the milk using an up-and-down motion with the ladle. Stop stirring briefly and pour the diluted rennet over the top of the ladle. Begin stirring up and down again for 10 seconds. Hold the ladle to the top of the milk in several spots to help still the milk. Let the curd set until a clean break is achieved, about 5 minutes. Cut Curd: Cut the curd into 1/4-inch to 1/2-inch (6 to 12 mm) cubes. Heat and Stir Curd: Heat the curds very gradually, stirring gently, to 105°F (41°C) over 5–10 minutes. Drain: Remove the pot from the heat. Position the colander over the second pot. Pour or ladle the curds into the colander and let the whey drain while you do the next step. Prepare Whey: Add the salt to the pot with the whey. Place the pot over medium high heat and heat the whey until the temperature reaches 150ºF (66ºC). Tear off a small piece of the reserved drained curd and place it in the ladle. Immerse the curd in the hot whey for about 15 seconds and pull it out again. Gently squeeze and pull the curd to see if it will stretch. If not, heat the whey another 10ºF (6ºC) and test the curd again. Cut and Stretch Curd: Maintain the whey at the temperature at which your test piece stretched. Cut the curd mass into quarters. Working with one piece of curd at a time, place the curd in the bowl of the ladle and immerse it in the hot whey until it is pliable, 30–60 seconds. Pull the curd out and work it gently as shown in the photos above; be very gentle and try to not overwork it. Reheat the curd as needed to maintain a pliable texture. Repeat the process about three times until the curd feels smooth and looks shiny; reserve the whey. Chill: Fill the bowl with cold water. Place the formed balls in the water to chill and set the shape. Store and Use: Use the mozzarella within a few hours, or chill some of the salted whey and store the mozzarella in it and refrigerate for up to seven days. If you want to use the mozzarella for pizza, wrap the balls in plastic and refrigerate for up to 1 week; it will melt beautifully after the first 2 days. Curd is grainy, crumbly, won’t stretch: Too much acid, try using about 1/4 tsp. (1gm) less next time. Be sure to measure the citric acid very carefully. Curd is firm, breaks when stretched: Not enough citric acid, try using about 1/4 tsp. (1gm) more next time. Again, be sure to measure the citric acid very carefully. 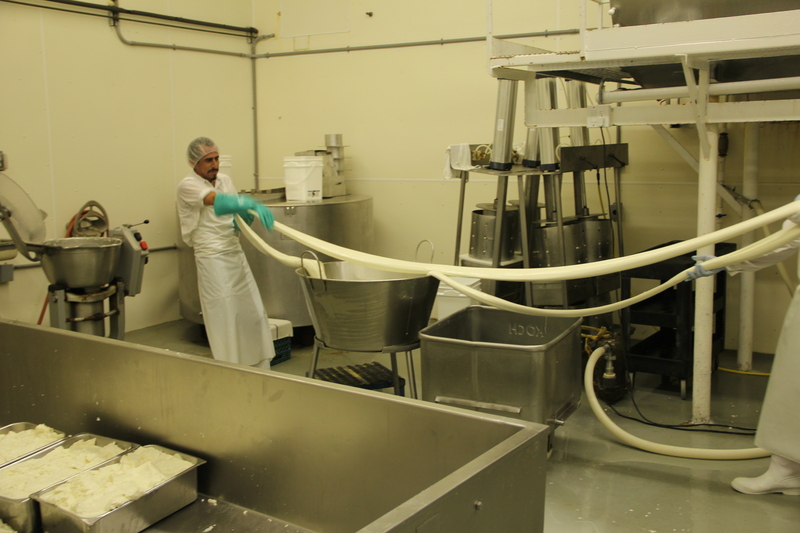 Curd stretched well, but end result is rubbery and bouncy: Curd is overstretched, overworked, or overheated. It is easy to squeeze out the butterfat during stretching. If the temperature of the whey is too hot, it can also melt the fat out of the curd. Keep practicing and be very gentle. This cheese is a demonstration not only of how curd behaves, but also of how you can easily (and often accidentally) change its properties. The chemistry of making mozzarella is pretty fascinating: you are using acid and heat to manipulate the minerals and the way the curd structure moves—and in quite a different fashion than in the high-heat added-acid cheeses in chapter 4. If you ever move on to making traditional mozzarella, you will be doing the same manipulation, but by using the starter bacteria to make just the right amount of acid—this is the time-consuming part. If you had fun making mozzarella, you will probably love the bonus recipe below for little stuffed pillows of stretched curd cheese: burrata. This recipe is just for fun—and deliciousness! It combines the above recipe for making mozzarella with a recipe for making ricotta using whey and milk. Making the dumplings turn out just the way you want may take a bit of practice, but the results are worth it. And no matter how they turn out, you can still eat them! Burrata, or burratina, is a rather new cheese that was created in the early 1900s as a way to use up bits of curd left over from forming mozzarella. Its name comes from burra, the Italian word for butter, and refers to the buttery texture of the filling. The recipe I have provided here includes a bit of butter in the filling, but you can have fun with it and fill burrata with some fairly creative combinations including ricotta and blue cheese, seasoned ricotta, and bits of mozzarella curd. On a 2015 trip to Italy, we enjoyed burratina affumicata, a tender, moist burrata that had been smoked in a tiny basket and served on a bed of fresh arugula. Heat Whey: Pour the milk into the pot with the whey, and place the pot over medium high heat. Heat the mixture, stirring gently, until the temperature reaches 175ºF (79ºC) and it coagulates into curds. Add Acid: If the liquid is still white and milky, stir in the diluted citric acid solution. Remove the pot from the heat and let set for 5 minutes. Drain Curd: Using the small sieve, skim the curds from the top of the whey and let drain over the pot for about 3 minutes. Finish Filling: Using the spatula, scrape the ricotta into the bowl. Stir in the butter and salt and pepper to taste. Set aside. Heat Whey: Stir the pure salt into the whey. Check that the temperature of the whey is still 175ºF (79ºC). Cut and Stretch Curd: Cut the curd mass into 10–12 even pieces. Working with one piece of curd at a time, place the curd in the ladle and immerse it the hot whey until it is pliable, 10–20 seconds. Place it on the plate and gently work it by folding it in toward the center in a circular pattern and pressing softly down; reheat the curd as needed to maintain a pliable texture. Repeat the process about two times just until the curd feels smooth and looks shiny. Use your fingers to shape it into a flat patty about 3 inches by 3 inches (7 cm by 7 cm). Fill and Form Dumplings: Working with one patty at a time, spoon a small amount of the ricotta filling into the center. To form the packet, bring two opposite sides of the curd patty together, then the other two, making a small purse. Press the top of the gathered edges gently over and lay it, gathered-side down, onto the ladle. Carefully immerse the dumpling in the hot whey until the edges are sealed, 5–8 seconds. Chill: Serve the burrata immediately, or fill the second bowl with cold water and place the dumplings in the water just long enough to firm them up, about 10 minutes. 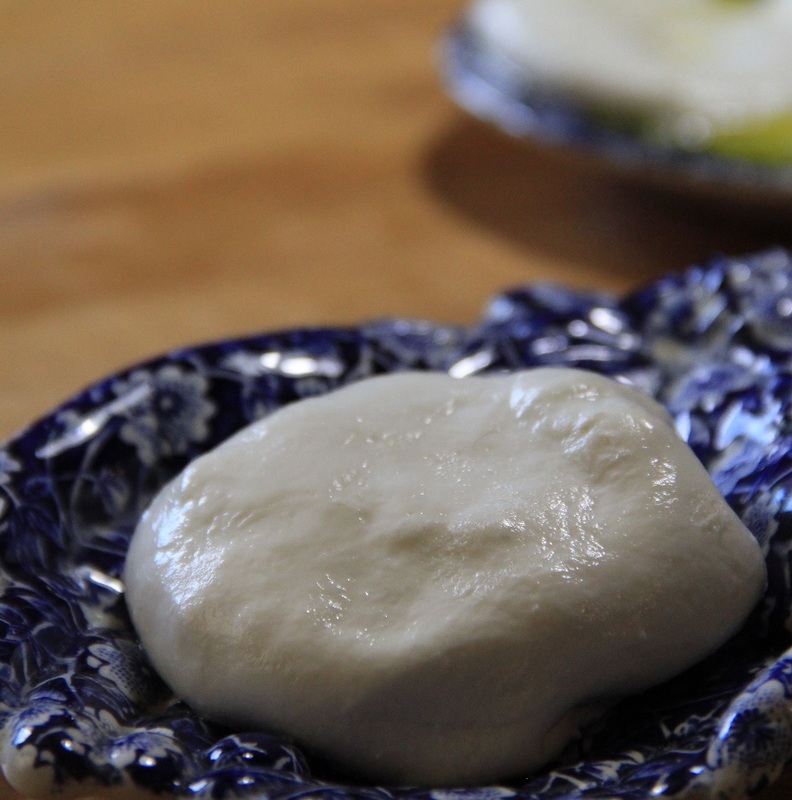 Store and Use: Use the burrata within a day for the best texture. Serve alone or drizzled with a high-quality aged balsamic vinegar, chopped fresh basil, and garden-fresh tomatoes, or use in any recipe calling for burrata. I often refer to feta as the gateway cheese, not because it will transform someone who doesn’t like cheese into a cheese lover, but because it is the perfect first cheese for those wanting to learn how to make more complicated cheeses such as those in the next chapter. Feta can also easily be aged, even at home with no special equipment. It is the ideal cheese to make now and enjoy later. The name “feta” is most correctly applied to this cheese when it is made in Greece and uses mostly sheep’s milk and a bit of goat’s milk. But many other countries have made virtually identical products by other names. Whatever you call it, this cheese is salty, tangy, and may be crumbly and dry or soft and creamy depending on the techniques used during cheesemaking. Feta and its Mediterranean cousins such as Telemes, a cow’s milk version, are salty because they are preserved in brine. Salt has long been a way of preserving food, and in seaside countries it lent its talent to preserving cheese. Even when stored in heavy salt, feta continues to age, developing flavor and changing in texture. I’m going to explain how to salt it for use now and later, and also how to age it in an oil marinade. Heat Milk: Pour the milk into the pot, and set the pot into a warm-water bath. Heat the milk until the temperature reaches 88–90°F (31–32°C). Add Culture: Sprinkle the culture on top of milk and let it set for 3–5 minutes. Stir gently for 2–5 minutes. Ripen: Maintain the temperature of the milk at 88°F–90°F (31°C–32°C), stirring occasionally, and let ripen for 1 hour. Add Calcium Chloride (optional): Stir in the diluted calcium chloride, if using, and let set for 5 minutes. Add Rennet: Stir the milk using an up-and-down motion with the ladle. Stop stirring briefly and pour the diluted rennet over the top of the ladle. Begin stirring again for 1 minute. Hold the ladle to the top of the milk in several spots to help still the milk. Coagulate: Maintain the temperature of the milk at 88–90°F (31–32°C), and let the curd set until a clean break is achieved, about 45 minutes. Cut Curd: Cut the curd mass into 3/4-inch to 1-inch (2-cm to 3-cm) cubes, and let rest for10–15 minutes. 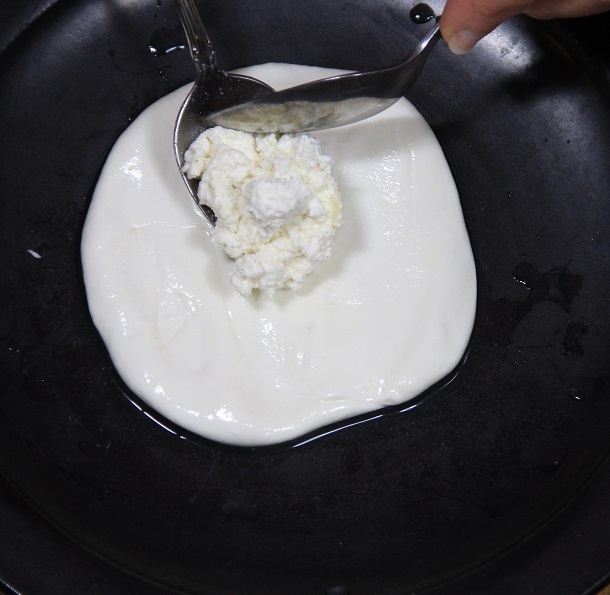 Heat and Stir Curd: Maintain the temperature of the curds at 88–90°F (31–32°C) and stir gently for 20 minutes; the curds will be very tender and soft. Let the curds rest for 5 minutes. Drain: Position the colander over another pot and line it with the cheesecloth. Carefully ladle most of the curds from the pot into the lined colander. Gently pour the rest of the curds and whey into the colander. Tie the corners of the cheesecloth together. Tie the bundle to the handle of the ladle and set across the top of the pot. Allow the curds to drain at room temperature, 68–72°F (20–22°C) for 12 hours. The bundle should not touch the whey; drain the whey if too much collects at the bottom. If needed, you can tighten the bag a bit, but don’t squeeze the curds. Salt: Unwrap the feta and cut it into 1-inch-thick (3-cm-thick) slabs. Sprinkle salt on all sides of these slabs and place in the tub and cover or a zipper lock bag. Let set at room temperature, turning occasionally to coat with the salt and whey, for 8 hours. Store and Use: Use the fresh feta right away, or tightly cover and refrigerate. Aging or storing in brine: Follow the steps above and reserve the salty whey from the salting step. Pack the slabs as tightly as possible in a tub or jar, filling the spaces with bits of the cheese that might break off or not fit otherwise, and pour the reserved brine over the top. Add 1 teaspoon (5 g) of pure salt and let set at room temperature, 68°F–72°F (20°C–22°C), for 8 hours. The cheese should create its own brine. If there is still airspace in the tub but the brine covers the cheese, cover the cheese and brine with a piece of plastic wrap, and then put the lid on the tub. Let age for several weeks to months. Check the cheese occasionally for flavor and texture. Aging or storing in oil: Follow the steps above for fresh feta, but let the cheese mellow for three days in the refrigerator. During this time, drain the brine from it daily. Cut the slabs into bite sized cubes and place in a glass jar. Cover the cubes with olive oil or a mixture of olive oil and another, less likely to solidify oil, such as rice bran oil, and screw the lid on the jar. Don’t use olive oil that is too high quality or the flavor will overwhelm the cheese. You can add herbs to the oil, if desired. Age the marinated cheese in the back of the refrigerator for up to one year. Curd of the finished cheese is sponge-like with hundreds of small, oval shaped holes (or eyes): This is called “early blowing” and is a sign of contamination by coliform bacteria. Coliforms are from the environment and can be harmless, but may also include some extremely dangerous, disease-causing germs. They can contaminate raw milk or be introduced into pasteurized milk after it is heat treated. Throw the batch out and improve your equipment sanitation. If you are using raw milk, choose a different source (see chapter 2). Too salty: Feta is supposed to be salty, so this is not necessarily a legitimate problem. But if you prefer yours less salty, add less salt and don’t age it. For feta that is aged in brine, you can soak it briefly in water to rinse away much of the salt before using. Not tangy enough: The room was probably not warm enough during draining. Try not letting the temperature drop below 72ºF (22ºC) if possible, or hanging the curds for an hour or so longer to let more acid develop. Got soft during aging in brine: This means that there was not enough calcium in the milk and therefore in the whey brine. Remove the soft cheese from the tub and make a new brine of 1 quart (500 ml) water, 6 tbsp. (90 gm) pure salt, 1/2 teaspoon (2.5 ml) white or cider vinegar, and 1 tsp. (5 ml) calcium chloride. Next time add calcium chloride to the natural brine in the tub before aging. Feta is such a versatile cooking cheese. You can use it on and in just about anything, often foregoing added salt. The fact that it is so easy to age also makes it a great cheese to have on hand. You can add flavors such as herbs and spices to the curd just before draining or to an oil marinade. Farmhouse, farmstead, farmer’s, cottage, landholder—all of these terms have been applied to simple cheeses made to be eaten young or slightly aged. Usually made from raw milk and lightly cooked and lightly pressed, they are simple, pleasant, and versatile. Because the curd is stirred and heated a bit, and much of the whey is removed by pressing, these cheeses have a longer shelf life than the paneer in chapter 4. This recipe is also not much different from one for a cheese that could be aged for longer. It is a great one to boost your confidence and get you ready for the next step on your journey. Heat Milk: Pour the milk into the pot, and place the pot over another pot of water on the stovetop. Heat the milk until the temperature reaches 88–90°F (31–32°C). Ripen: Maintain the temperature of the milk at 88–90°F (31–32°C), stirring occasionally, and let ripen for 30 minutes. 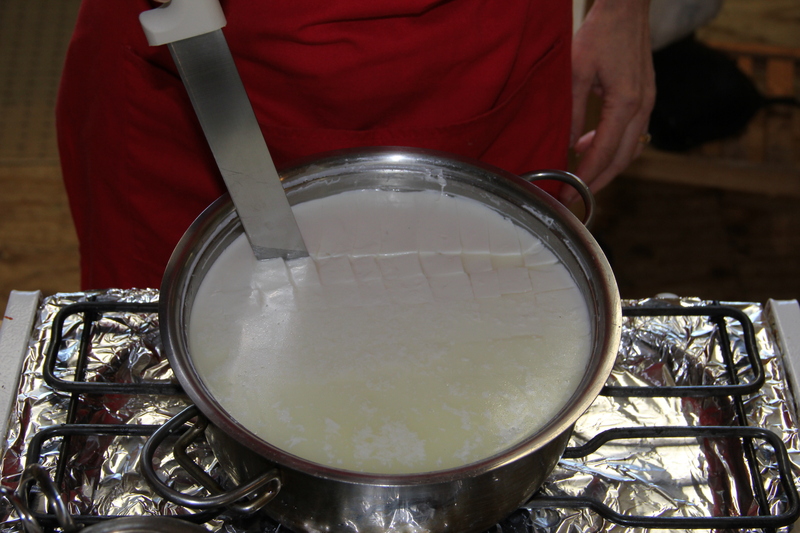 Cut Curd: Cut the curd mass into 3/8-inch (1-cm) cubes, and let rest for 5 minutes. Heat and Stir Curd: Heat the curds very gradually, stirring gently, to 100°F (38°C) over 30 minutes; increase the temperature a bit more slowly in the beginning, especially during the first 15 minutes. If needed, cut any large curds into smaller pieces during stirring. Maintain the temperature of the curds at 100°F (38°C) for 20 minutes, stirring constantly and gently until the curds are uniform in size and feel tender but springy, similar to the texture of a hard-boiled egg white, about 15 minutes. Remove the pot from the heat and let the curds set for 5 minutes. Partial Drain: Scoop out the whey to the level of the curds; reserve some of the whey. 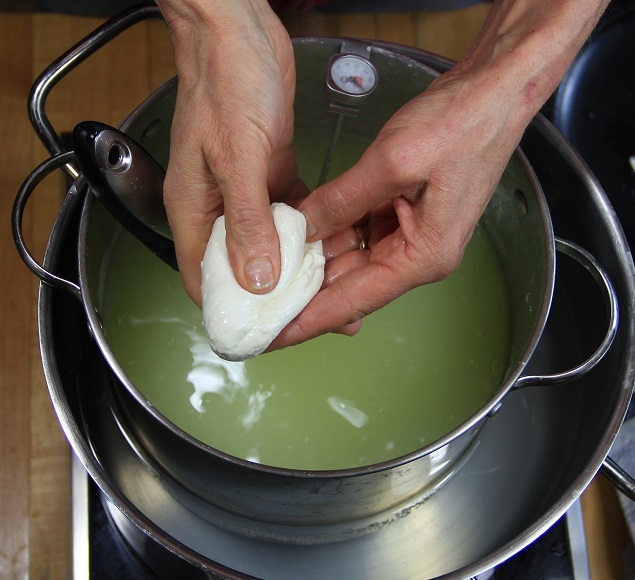 Using your hands, work the curds gently into a solid mass about the size of the form that you are using. Drain and Press: Place the form on a tray or a drain board. Line the form with the cheesecloth and dampen it with a bit of whey. Using your hands, lift the curd mass out of the pot and press it gently into the form. 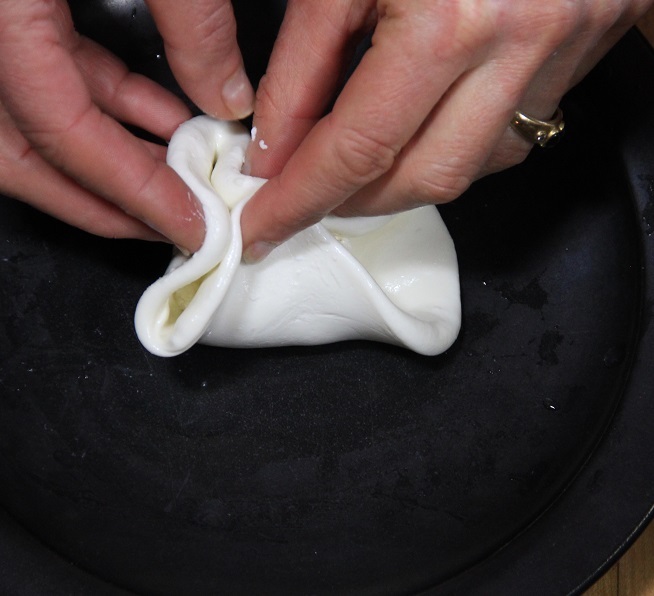 When it evenly fills the form, fold the excess cloth over the curd, set the follower on top, and press down gently. Add about 1 pound (0.5 kg) of weight. Press for 15 minutes at room temperature, 68–72°F (20–22°C). Remove the weight and the follower. Then remove the wrapped cheese from the form, unwrap it, and flip it over. Rearrange the cheesecloth in the form, and then replace the cheese, pressing the cloth into the form along with it; the cheese should still look a bit wrinkled and the rind not yet smooth. Continue to press with only 1 pound (0.5 kg) of weight for 30 minutes more. Repeat the steps above, flipping the cheese and rearranging it in the form; this time the rind should be smoother, but still not evenly closed. Add another 1 pound (0.5 kg) of weight for a total of 2 pounds (1 kg) and continue to press for 60 minutes more. Repeat the steps again; now the rind should be very even, perhaps with a few small openings. If not, you may add up to 2 pounds more weight. Continue to press for 4 hours more. Remove the cheese from the form, cut off a tiny piece, and taste it. It should have a very mild tang and taste milky with a hint of buttermilk. If it isn’t slightly tangy, press it for 1 hour more and taste it again. Salt: When you have achieved the desired tang, take the cheese from the form, unwrap, and rub the cheese all over with 1 tbs. (15g) of the salt. Replace the cheese in the form, without the cheesecloth, and let it set for 30 minutes. Remove the cheese and rub it with the remaining 1 tbsp. (15g) of salt. Place the cheese in the tub, cover, and let it set in the refrigerator for 8–12 hours. After setting there may be a bit of salty whey at the bottom of the tub, if so rub the whey all over the cheese and flip it over. Repeat this process 2–3 times daily for the next 3 days. During this time the cheese will change in texture and flavor as the salt moves through the wheel and the cheese mellows. Store and Use: Pat the cheese dry with paper towels and wrap tightly in plastic wrap or a plastic bag. Use or store in the refrigerator for up to 4 weeks. It will last longer and even age if there is very little air in the container and exposure to molds in the air outside of the fridge is limited. If a little mold develops on the outside, either cut it off before eating, or rub it with a bit of vinegar. Curd of the finished cheese is sponge-like with hundreds of small, oval shaped holes (or eyes): This is called “early blowing” and is a sign of contamination by coliform bacteria. Coliforms are from the environment and can be harmless but may also include some extremely dangerous disease causing germs. They can contaminate raw milk or be introduced into pasteurized milk – after it is heat treated. Throw the batch out and choose a different source if you are using raw milk (see chapter 2) also improve your sanitation and preparation of equipment. Wrinkles or openings in rind after pressing: You probably did not apply enough pressure and/or the room got too cool. You can usually fix this problem at the end of pressing by heating a pot of water to about 160°F (71°C) and then immersing the wheel into the hot water for 1–2 minutes. Quickly replace the cheese in the form with double the original weight and press for 10 minutes. This should smooth out the surface. Cheese tastes bland: Use 1/8 tsp. (0.2g) more culture the next time or extend the ripening phase by about 15 minutes. Also make sure the room isn’t too cool during pressing. When young this isn’t a super complex cheese by any means, but it shouldn’t be super boring either. Cheese tastes sour: Next time try either using 1/8 tsp. (0.2g) less culture or shortening the pressing time by about 15 minutes Also be sure that the room isn’t too warm during pressing and salting. Let’s consider the differences between this recipe and feta. You can certainly see and taste that the farmhouse cheese as salty, crumbly, and tangy as feta. You will notice some close similarities in the first few steps of the cheesemaking process, but then see how they diverge during the stirring phase. The feta wasn’t stirred and therefore retained more moisture in the curd. That moisture helped create the crumbly texture and tartness that are the hallmarks of feta. When curd is stirred and heated for longer, it loses more moisture earlier. This has a profound effect on the final texture of the cheese. Let’s move on to the next level: cheeses for aging. As an augmentation to the article I wrote for the summer culture the word on cheese magazine http://culturecheesemag.com/diy/beautiful-homemade-burrata , here are step by step photos of how to make burrata sachets, dumplings, packets or whatever you want to call them! Gather two sides together in the middle, overlapping and press them together. Gather the other two sides, squeezing closed any openings, and overlap in the center. Serve immediately or cool in bowl of cold water then wrap and chill. Best right away, though! If your Quick Mozzarella doesn’t always turn out perfectly, despite many recipe’s suggesting that it is “so easy”, stop blaming yourself! Stretched curd cheeses, often referred to by their Italian name of “pasta filata”, depend upon some pretty precise chemistry occurring in order to turn out well. 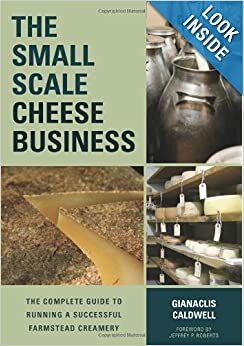 In this article I have extracted a bit of what I cover in an entire chapter in my book “Mastering Artisan Cheesemaking” on the subject of stretched curd cheeses. I have included three recipes, from Quick to Long. Before curd can stretch there must be specific changes in the protein structure. For those changes to occur, the curd must reach the magic pH level of about 5.2. Through the development of acid, calcium is removed from the protein structures, allowing for the formation of the right kind of protein network for stretching. (You can read more about how calcium and other minerals interact with acid in chapters 1 and 3 of my book.) To successfully make these cheeses, you need to be able to monitor the development of acid. A pH meter is the easiest method, but I’ll be telling you how to perform a stretch test on your curd that will tell you the same thing (this is the way they did it in “the old days”). Stretched curd cheeses are heated in hot whey or a water before they are stretched. In addition to getting the curd to the right temperature at which the protein structure can begin to elongate and move, this high-heat treatment essentially (but not by legal definition) pasteurizes these cheeses. Any culture remaining will be killed as well—one more reason it is important to be sure to have the proper acid development before you try to stretch the curd. Some of the coagulant used will be deactivated, too, causing changes in the breakdown of protein during aging. But the enzymes remaining from the starter culture should provide plenty of protein breakdown power if you are making an aged version of this type of cheese. Let’s go over the two main approaches to making these cheeses – the quick, added acid method and the long, traditional method. You can also combine the two, as Christy Harris has done in the recipe she provided for my book. If you are making a variety that you want to age, go for the traditional approach! Quick, easy recipes for mozzarella rely upon the addition of a food acid, almost always citric acid, at the right level to lower the milk pH to the magic 5.2 range. If the milk starts out at a different pH than usual, though, and your measurements are not precise (frankly measuring with a teaspoon is never that exact) then you may end up with a pH above or below the needed level. Too low or too high and the curd won’t stretch. Because the acid is added when the milk is still a liquid, you can’t perform the old fashion stretch test that I am going to tell you about in a bit to determine if the acid level is perfect, but you can use pH strips or a pH meter. Still, these recipes works more often than not and you can increase your odds of success by weighing the calcium chloride and then keeping a good record of the results. While many quick mozzarella recipes call for using a microwave to heat the curd, skip this approach and use the whey. It is just as easy, in my opinion, and less messy, more accurate, and better for the curd. Microwave ovens rarely, if ever, heat the curd evenly. Even heating is quite important to the process. 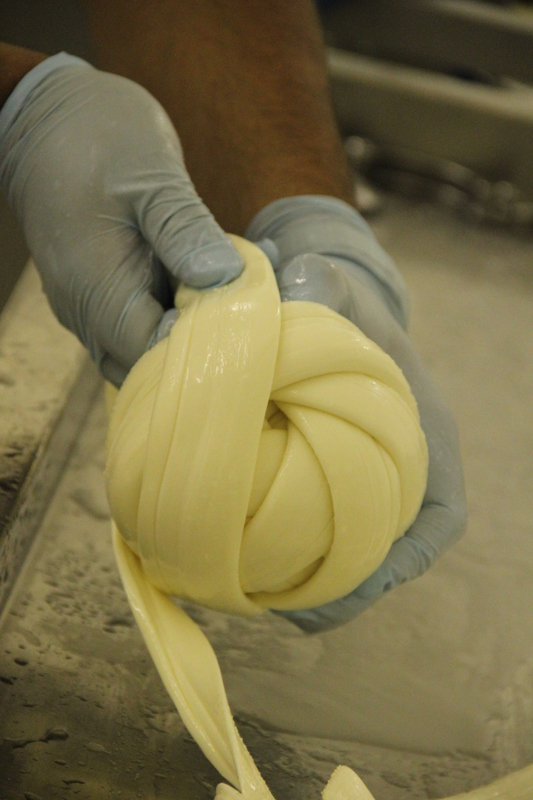 Mozzarella, Provolone, Caciocavallo, and Queso Oaxaca are just a few of the cheeses made using the pasta filata techniques. Very few commercially available versions are still made by hand, but you can find a few stalwart artisans carrying on these traditions today. If you have made traditional cheddar cheese, prepare to be surprised at how similar the process is, except for the stretching. It is believed that the Britons learned the many of the processes of cheddar making by watching the Roman invaders make mozzarella type cheeses. Traditional pasta filata cheeses develop the right amount of acid after a long ripening period, partially in the whey and partially after the curd is drained and kept warm. When the goal pH nears (or you think it is almost ready) a stretch test should be done. 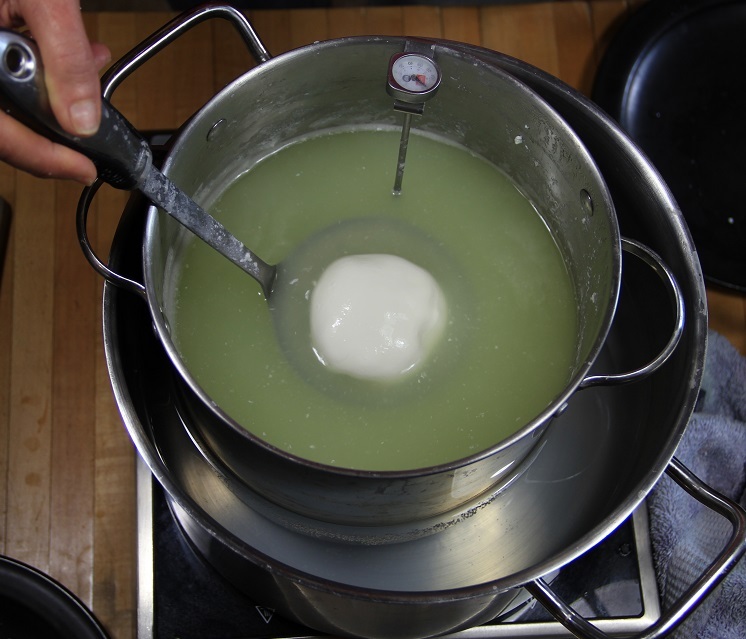 A piece of curd is heated in hot whey or water and tested for its ability to stretch. After heating the chunk, fold it in on itself a few times, observing the texture. If it folds easily, heat it again and fold again. Then heat a third time and try pulling the piece away from itself. If ready, it will stretch into a long, thin strand. At this point the rest of the curd can be stretch or cooled and frozen for future shaping. (In some parts of the country you can buy curd ready to stretch). Some recipes use Mesophilic cultures, others Thermophilic and still others a combination of bacteria. Old world recipes often use raw milk and rennet paste (producing a sharp, piquant flavor). Lipase can be added to help emulate this more complex flavor profile. When using the whey from making traditional and hybrid mozzarella, it is a good idea to first heat the whey until the proteins left in the whey precipitate out of the liquid, usually at about 185F. Skim these delicious real ricotta curds off of the top with a sieve and drain. Then let the whey cool to 175-180 for stretching the curd. Hand stretching is extremely physical and requires deftness and care, here cheesemakers at Ochoa Cheese work the curd like pros. When the curd is ready to stretch, it is a good idea to cut it into small chunks before heating, as this will help heat it evenly. I suggest using a small strainer basket or sieve to lower the curd into the hot whey. When beginning to work the curd, use gentle folding motions, bending the sides in towards the back of the mass (if you have ever made a loaf of bread, the motions are almost identical). At any time when the curd becomes too cool to move easily, reheat it! When the mass is shiny, usually after a couple of rounds of folding and heating, then it is ready to shape. 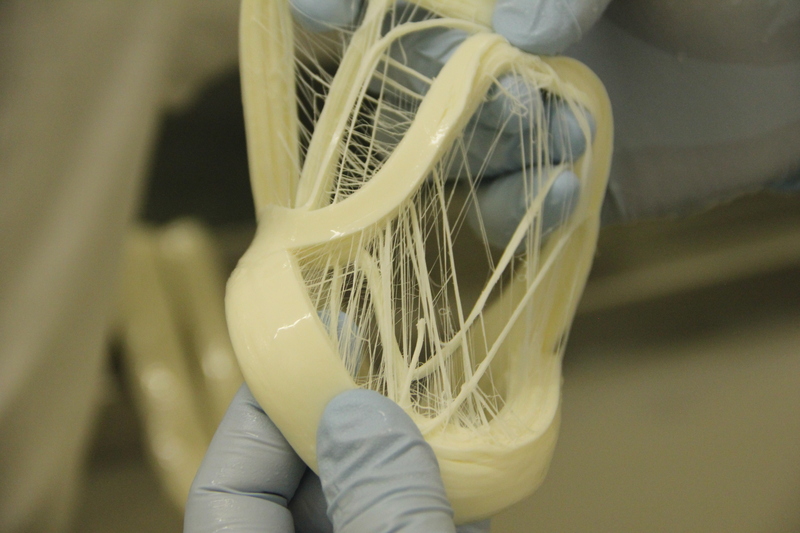 If you are making “string” cheese or a skein (as with queso Oaxaca or queso asedero) then put the curd through several stretching sessions to continually elongate and align the protein networks. When the final shape has been attained, cool the cheese in water. Salt can be added to the heating water and/or the cooling water. Combine milk, citric acid solution, and calcium chloride solution. Warm milk to 90 F, stirring evenly. Remove from heat and stir in rennet solution with an up and down motion. Still the milk, cover and let set for 5 minutes until curd is well gelled. Cut the curd into ½ inch pieces let set for 2 minutes. Stir and heat the curd to 105 F over 5-10 minutes or until curd starts to feel somewhat “plastic” or gooey. Place a colander over a pot and pour curds into it, reserving the whey. Cover curds. Cut up curd mass into 1 inch chunks then lower them in 1-2 cup amounts into hot whey. Stretch, following stretching tips earlier. 10. Gently stir and heat to 115F over 30 minutes. 12. Pour off the whey (saving) and pour curds into cloth lined colander. Set over the drained whey, cover, and keep curds at 102F, turning mass every 30 minutes, until curd passes the stretch test (described earlier). Warm milk to 80F and sprinkle cultures on top. Let set 5 minutes. Stir well. Increase temperature to 90F and hold for one hour. Stir in calcium chloride if using. Stir in rennet solution with an up and down motion for one minute. Still milk and let set quietly until clean break is achieved. Goal coagulation time is 45 minutes. Stir gently and heat slowly to 95-98F over 15 minutes. Then stir and heat to 118F over 30 more minutes. Hold at 118F, stirring occasionally to keep from matting, until curd pH is 6.0. This may take 60-90 minutes. Drain the curds (saving whey) in a colander. Cover colander and place over warm pot, keeping the curd temperature at about 102-104 F.
Turn curd mass every 30-45 minutes until curd pH is about 5.2 or when curd passes stretch test. Heat whey to 180F, add a pinch of salt and follow stretching directions. Curd can also be chilled and saved to stretch later (it can also be frozen). Quick versions of mozzarella can be stored in the refrigerator for a few days, but will not age safely. They are best used fresh! The traditional method can be used fresh, stored in a light brine made from whey, smoked, and aged. The hybrid method can also be aged, but will likely be a little less complex do to less bacterial activity. Mix one quart of filtered (through cloth) whey left over after stretching with an 1/8 teaspoon of salt. This amount can be adjusted depending upon if you salted the whey during stretching or the water during chilling. The saltier they mixture, the more firm the cheese will be, so if you want it tender, you may want to omit the salt completely. Immerse small balls or discs of fresh mozzarella in the solution. A ziplock type bag can be used – squeeze the extra air out of the bag so that moisture surrounds the balls. This method requires less liquid. If the liquid becomes cloudy or the cheese starts getting soggy or soft, you probably need to add a bit of calcium chloride to the brine. Try about ¼ teaspoon per quart. Adjust up if the cheese continues to soften and less if the cheese becomes too firm.